Square Enix Calls Final Fantasy XIII-2 "Dark and Mysterious"
Lightning won't be breaking out a microphone for her appearance in Final Fantasy XIII-2. New details on Final Fantasy XIII-2 have been made available in the latest issue of Japan's Dengeki magazine. Yoshinori Kitase and Motomu Toriyama, the game's producer and director, have revealed that the direct sequel to Final Fantasy XIII won't replicate the formula of Final Fantasy X-2 and will change a lot more than fans might think. Final Fantasy X-2 was a lighthearted affair with the main characters constantly changing outfits and singing their hearts out. Kitase and Toriyama confirmed that Final Fantasy XIII-2 will not feature a singing Lightning. Instead, the game will have a "dark and mysterious" feel. It'll start right in Gran Pulse (no more 20 hour wait before the good stuff), and be a "true sequel," meaning that Final Fantasy XIII-2's story will directly continue that from the first game and even take a look at what went on behind the scenes during Final Fantasy XIII. 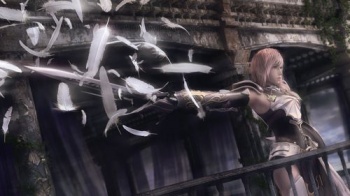 As expected from XIII-2's first trailer, the game will focus on Lightning and the goddess Etro. Kitase and Toriyama said that they've been listening to criticisms of Final Fantasy XIII from all over the world regarding "characters, story and interface," and are incorporating that feedback into Final Fantasy XIII-2. The ATB battle system is being "evolved," with difficulty settings under discussion. The cast of characters from the original game will return, but some may feature major changes and appear in "unexpected forms." The battle system in Final Fantasy XIII wasn't the bees knees for me, so I'm intrigued by its potential in an improved form, and by the "unexpected" future appearances of Sazh and... well mostly just Sazh. Maybe Square Enix will armor him up like the new Lightning to become even more of a badass, or replace his hand with a Gatling gun.